Interesting. I have been using the Kardia band on my apple 3 watch for a year and paid for the premium plan as well. I ordered the new Apple Watch 4 today, since the app is finally out. I found the Kardia very helpful until I began Tikosyn. I have frequent PACs which seems to confuse the reading now, as my EP tells me I am in normal rhythm, and While I often don’t feel normal, I can tell the difference, but Kardia says possible afib or unclassified. I am grateful for the Kardia till now….not one useless hospital ER, despite some rough months. Between Kardia,my doctor, and my own calm monitoring I knew when I was NOT in trouble. I had hoped the apple watch4 would be better but your testing is discouraging. However, with trade in on my A watch3, and the cancellation of my monthly $9.99 charge for the Kardia Premium, I feel it will not really be more expensive. (And my vanity has finally been served. i can go back to stylish watch bands. 🤷‍♀️) My pleas to Kardia went unnoticed. I have appreciated your reporting and it has informed my decisions on these devices. 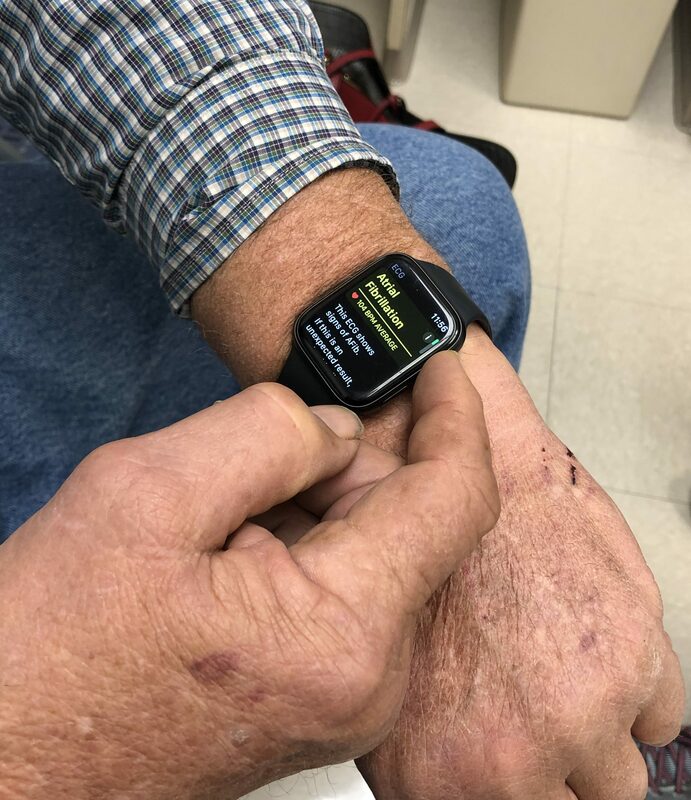 This and your prior comments about the Kardia product and Apple watch seem consistent with the possibility that you are a paid “consultant” to AliveCor. Although I appreciate your experience, if you have any ties to the Kardia product this should be revealed, and if not, please state so. 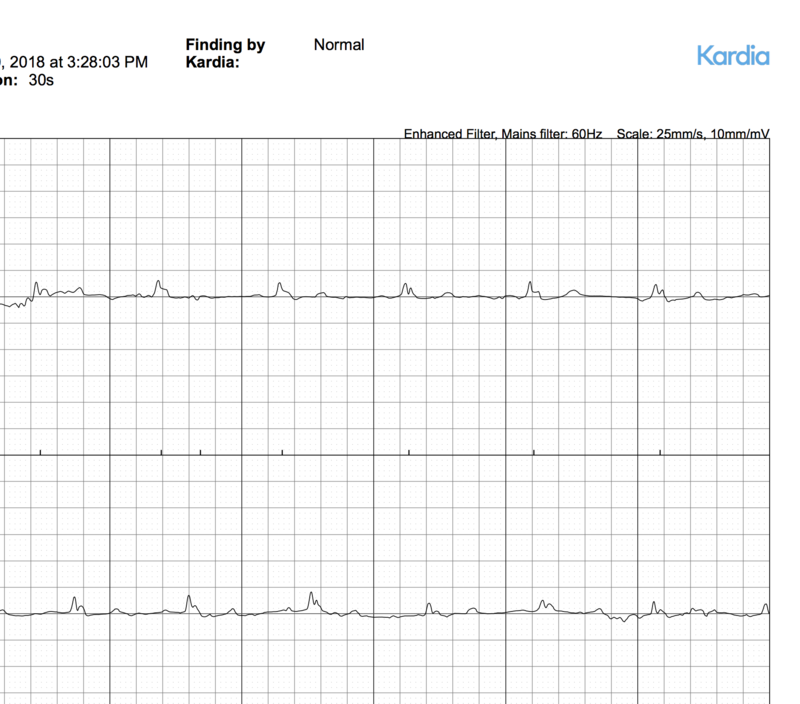 My previous post about Kardia Pro was very positive but if you look at all I’ve written about Kardia and AliveCor over the last 5 years you will see it is very balanced and often points out inaccuracies of the device. Because my post on KardiaPro eliminating need for long term monitors was so positive I posted the following at the end of it. This statement is still true and I still don’t know if Alivecor is listed on the stock market. Feedback on Apple Watch Kardia Smart Rhythm app would be appreciated. Especially in comparison to the Apple Watch 4 Heart app. When Kardia Smart Rhythm is running on my Apple Watch 3 the movement monitoring functions are shut down. 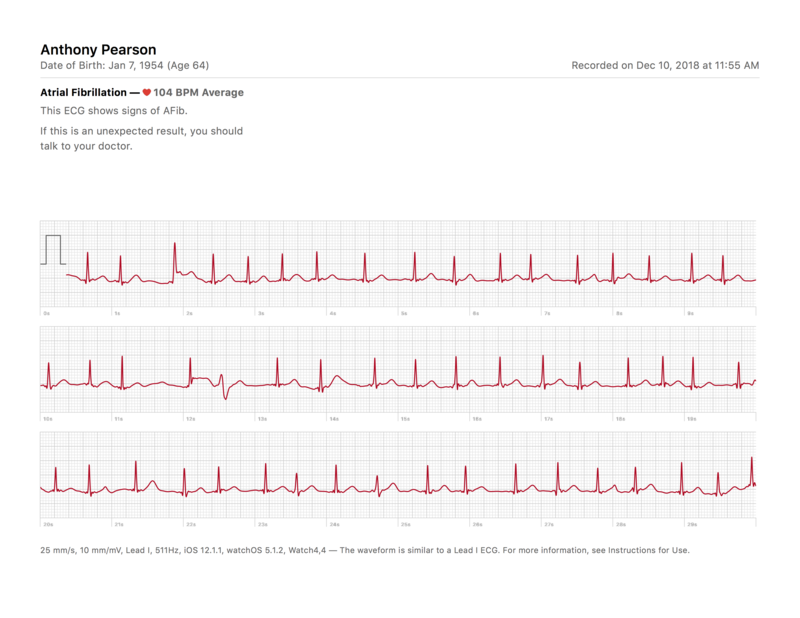 So the watch is now dedicated to solely monitoring heart rhythm. It seems to me that notifications via the Smart Rhythm app are more accurate than the native Apple Heart app, but I think that with the Apple app the activity monitoring is unaffected. I have the Kardia Bluetooth device attached to my iphone, but will soon get a Kardia band for the watch. Thanks for these posts – very interesting and much appreciated. The important advantage of the Kardia band (also the original two pad mobile) over the AW4 is the rapid expert reporting on any ECG that shows an irregularity. And the ability of cardiologists like Dr P to access and review remotely. The Kardia review costs are modest, with the choice of a technician report at very reasonable cost, or a cardiologist report at a slightly higher cost. Reports delivered very promptly in my limited experience. Interestingly, the Qardioarm BP monitor identified cardiac irregularities while the Kardia Smart Rhythm on AW3 gave no alerts, despite some yellow lines on graph. Perhaps a fit 73 year old skiing at 11,000 feet defeated their algorithm. Would recommend Qardioarm despite a few quirks, and am perplexed by Apple’s outrageously stupid claims about AW4 being first ECG. Trust is difficult to build, and easy to damage. I now have doubts about the probity of Apple. Perhaps recent fall in price of Apple stock reflects these doubts. Deja vu all over again when the marketeers run a tech company. Thanks Dr P – your posts much appreciated. After six weeks of use I am quite satisfied with the change to my apple 4 from my Kardia band. As I indicated before, my biggest problem with the Kardia was my frequent PACs confused the readings giving me false afib readings or frequent unclassified readings. In the six weeks I have had no confusion on the Apple 4. The only time it has given me a reading that did not read normal was earlier this past week when I had a short period of aflutter, where it alerted me that my heart rate was abnormally high. 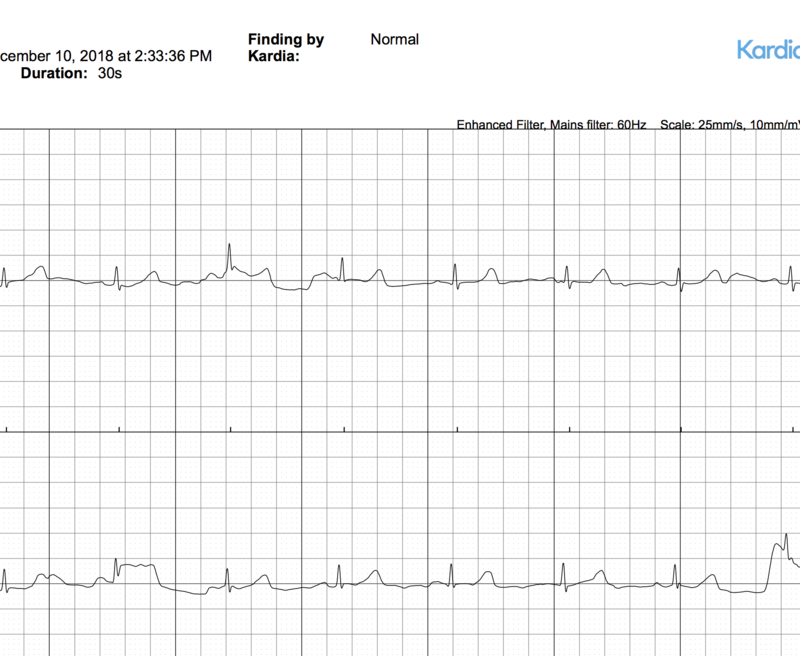 I checked my Kardia device, which I still carry with my iphone and it read unclassified and finally possible Afib. Many times in the past month when I knew I was having PACs I used both and always had a normal reading on the apple watch and either unclassified or possible afib on the kardia. My conclusion is that the apple watch is superior for my purpose as it seems to not be confused by my PACs. I am interested in others experience as more use both. I have had similar experience with PACS and Kardia. In addition both Qardia and Omron had wiggly heart icons that turned out to be PACS. So AW4 showed normal sinus, while the Kardia, Omron and Qardia reported a possible problem. 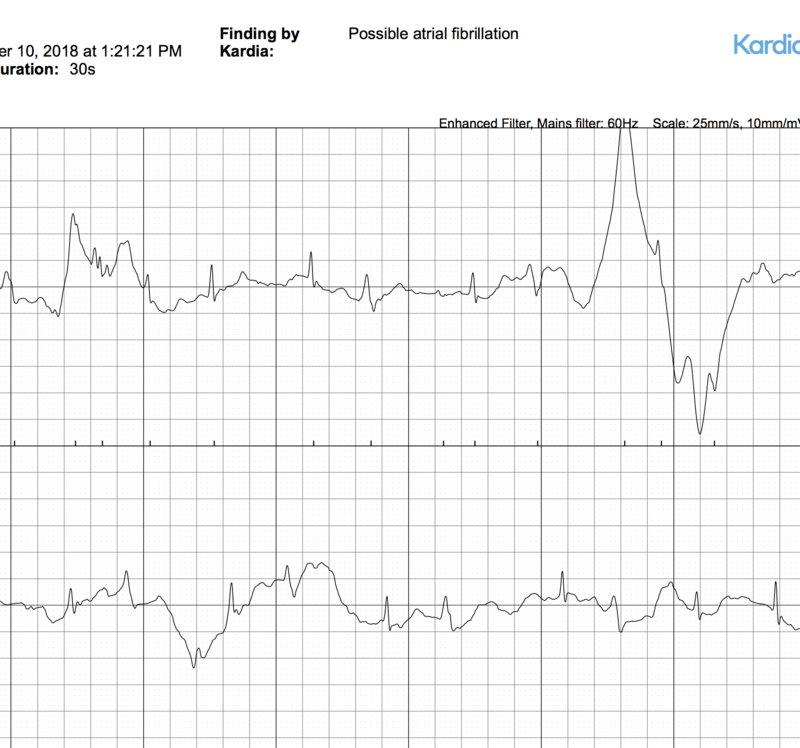 Send Kardia for specialist report and PACS diagnosed, but subsequent 12 lead specialist EKG gave normal sinus rhythm. While some advise that PACS can be ignored, I choose to try some lifestyle management- training sessions a little longer so HR not so close to Max, fewer HIT sessions, and to cut back on alcohol and chocolate. 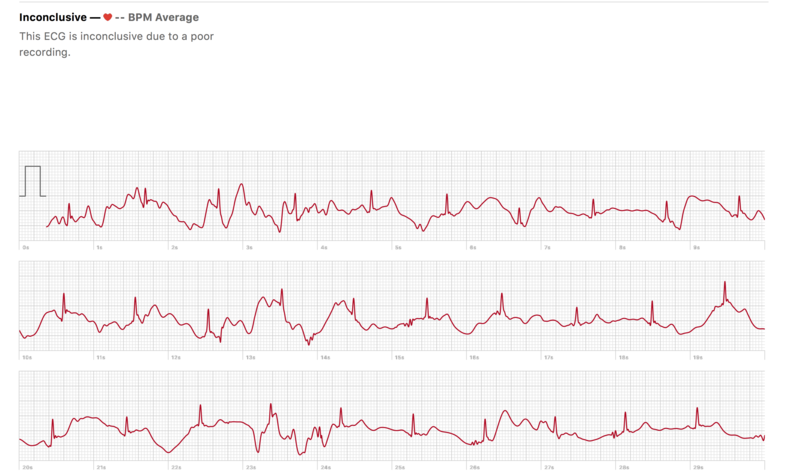 Seems to be helping in that all 4 devices now report no irregularities. I am curious about others experience. If I were to believe my Kardia I am in “possible Afib” almost daily. 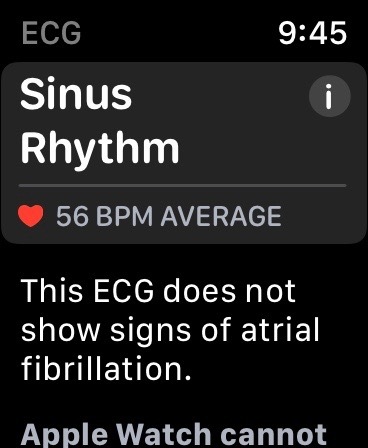 I check my Apple Watch 4 and it shows my irratic pattern with pacs but says NSR. I generally know when I am in Afib, and I absolutely recall the PACs that precede my Afib and Aflutter by since I have been on Tikosyn it no longer goes there, thank heaven. It generally calms quickly and both Kardia and Apple Watch then read Normal sinus rhythm. I am surprised that the skeptical cardiologist feels the Kardia is superior. I am sure we are all different but I am curious to know if others share our experience. I do not have Afib, nor have I ever used the Kardia. However, I was diagnosed with a 98% blockage in my widowmaker and decided to refuse stents or bypass and instead shift to a no oil plant based diet supplemented with the Pauling Rath Protocol, which for my level of blockage is 3 g Vitamin C + 3 g L-Lysine + 3 g L-Proline and 25 mg Niacin (this is adjusted over time to make sure you get the Niacin Flush), also bought a puppy and started walking. Sept 3rd ’18 Angiogram clearly showed the blockage with two others at about 50% and ultrasound measurement of LVEF was 17%. My daughter bought me the Apple Watch 4 because of the obvious risk of heart attack. One feature of my ECGs taken since 9-3-18 was a negative T wave and no P wave. 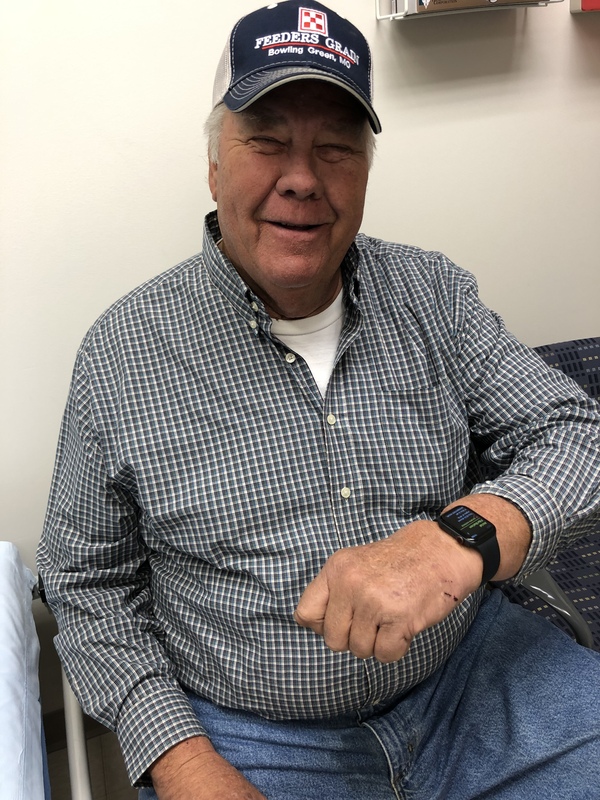 5 months into this diet exercise program, my watch is starting to show a small positive T & P wave, which were confirmed in my last 12 lead ECG at the hospital. 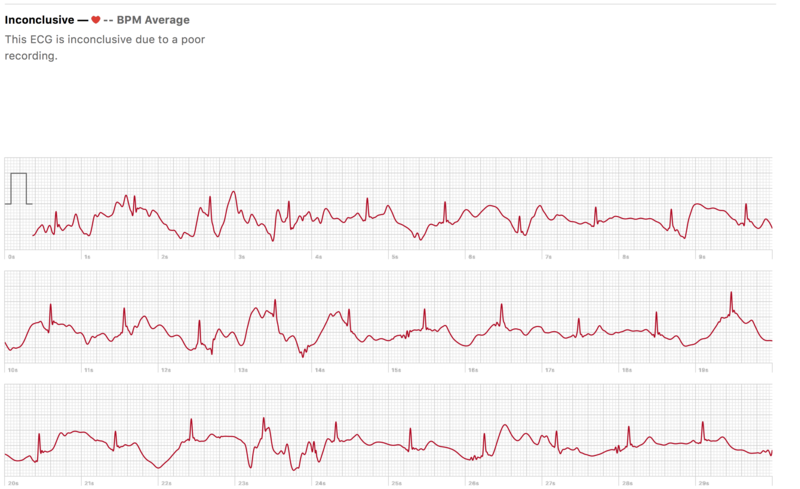 I think like anything new, as more refining is done the software will improve. I have been using Apple Computers since 1989. I only once upgraded a System at 7.0 and regretted it until 7.2! I use the ECG and the Workout App. I do High Intensity Training (I dance wildly to music until out of breath. 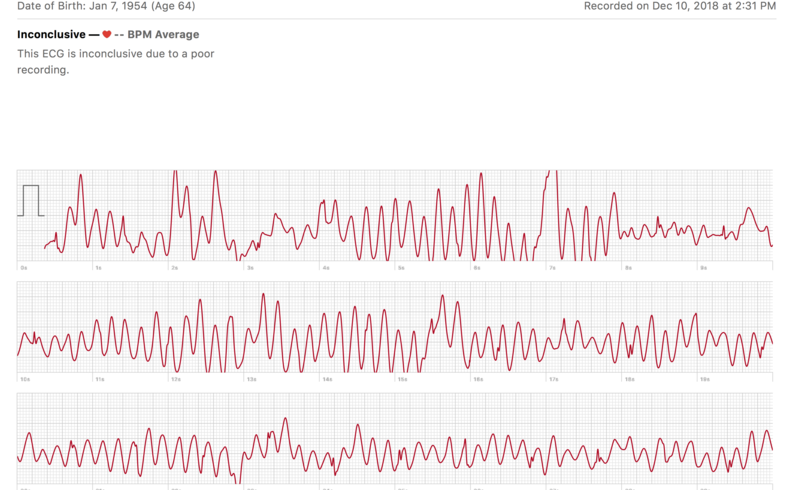 The peak heart rate and recovery only works about one time in 5 which Apple states quite clearly can happen in this particular setting (I find that odd because the Heart monitor is clearly showing it reading my heart beat, but that program says it cannot make a graph). I am sure as more data comes in and Apple sees how many cardiac patients are using this, it will improve. Was Kardia 1.0 perfect? Has it been tweaked and upgraded? As to your question about the jumpy lines, I find I need to turn the band so the watch is on my inner wrist (thinner skin? Less sunlight-tan gives better reading? Any African-South India origin using this?) and locked down tight, I get a better reading. On the outside of my wrist even tight there is a jumpiness each time I breathe in. Does that woman have any tremors? I would look at Cleveland Clinic’s Dr. Esselstyn’s book on reversing heart disease using diet. Then add the Pauling Rath Protocol.